You will depart in the morning for Vancouver Island by ferry. We'll be riding one of the state-of-the-art Super Ferries made in British Columbia, experiencing the beautiful scenery along the route. You will have many opportunities to take pictures or just stroll along the deck. 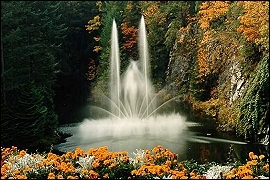 Upon arrival at the Butchart Gardens, you'll have plenty of time to enjoy the attractive setting of flower gardens and shrubs that are nicely arranged throughout the Gardens. The tour will then continue on to the city of Victoria, where we shall have lunch in the Chinatown area -- the place where one can imagine the life of early Chinese immigrants to Canada, who arrived from mainland China to work as laborers in the 1800's. The Chinese immigrants were instrumental in the construction of Canada’s western railways. In the afternoon, you will visit the famous Royal London Wax Museum (admission not included), with over 200 wax characters from history and famous events. You can also visit British Columbia’s legislative building at your leisure. The tour will then drive past Beacon Hill Park, and stop by kilometre "0" where our West-East cross country highway, the Trans-Canada Highway #1 begins. The tour will return to Vancouver in the evening.